Osteoporosis is a progressive disease which decreased bone strength increases the risk of a broken bone. Osteoporosis becomes more common with age, it is not limited to any gender, but it is more commonly seen in women around the world. Other common risk factors include family history, poor nutrition, physical inactivity, smoking, certain medications, alcohol usage, pregnancy. The National Osteoporosis Foundation calls it the “silent disease” because there are virtually no symptoms of bone loss in the early stages; its main consequence is the increased risk of bone fractures. 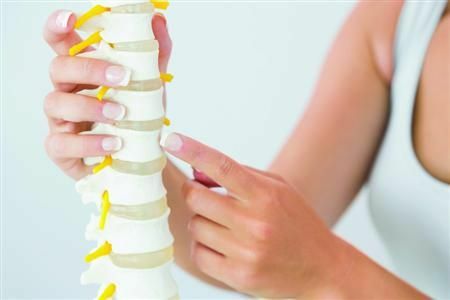 Osteoporotic fractures occur in situations where healthy people would not normally break a bone; they are therefore regarded as fragility fractures. Typical fragility fractures occur in the vertebral column, rib, hip and wrist. If you are diagnosed with osteoporosis or have a high risk of developing it, you must follow a strict diet and maintain a healthy lifestyle to help ward off or slow the disease progression. Plus, you can try these home remedies can help you prevent and maybe even reverse the symptoms of osteoporosis. 1. If you don’t have a dairy allergy or lactose intolerance, add nonfat dry milk to everyday foods and beverages, including soups, stews, and casseroles. Each teaspoon of dry milk adds about 20 mg of calcium to your diet. 2. Add a little vinegar to the water you use to make soup stock from bones. The vinegar will dissolve some of the calcium out of the bones, for a calcium-fortified soup. A pint can contain as much as 1,000 mg of calcium. Men and women between the ages of 19 and 50 need 1,000 milligrams of calcium a day. This daily amount increases to 1,200 milligrams when women turn 50 and men turn 70. Good sources of calcium include: nonfat milk, low-fat yogurt, dark leafy greens (like spinach), sardines, and soybeans. If you don’t get enough calcium in your diet, be sure to use a supplement to help prevent osteoporosis. However, too much calcium has been linked to heart problems and kidney stones. The Institute of Medicine recommends that total calcium intake, from supplements and diet combined, should be no more than 2,000 milligrams daily for people older than 50. Check out this New Chapter Bone Strength Take Care, Calcium – 120 ct, available through Amazon. Not only must you get enough calcium in your diet, you must also exercise to maintain strong bones. It has been found that regular physical exercise can help reduce bone loss, increase bone density and generally improve your bone health. Exercise for at least thirty minutes using weight-bearing exercise such as walking, jogging, aerobics, playing tennis or badminton, three times a week. Vitamin K2 is found in meat, eggs and dairy foods, especially fermented products such as cheese and yoghurt (which are also high in calcium). Note: People taking certain blood-thinning drugs, including warfarin, should not use vitamin K supplements. Magnesium deficiency is a huge factor for osteoporosis. Magnesium is actually more important than calcium for bone growth and bone density. As many as 90 percent or more of us are deficient in magnesium. You can get 50 mg of magnesium by eating 2 tablespoons of peanut butter. An apple a day can keep osteoporosis at bay. The phenomenal combination of antioxidants such as flavonoids and polyphenol makes the fruit one of the best bone strengthening agent. According to a French study, the flavonoids known as phloridzin that are present in apples help women to protect themselves from osteoporosis after their menopause just by improving inflammation and increasing bone density. Plus, apples are rich in boron, a trace mineral that helps the body hold on to calcium, which is the building block of bones as well as muscles. Almond milk contains a good amount of calcium and hence is a good remedy for osteoporosis. The flavonoids present in this milk helps to reduce the free radicals in the body that protects you from having osteoporosis. It also contains potassium, magnesium and manganese which are also very essential for the strengthening of bones. Soak 10 almonds in water overnight and then peel and blend them with one cup of warm milk (preferably goat’s milk). Add a pinch of saffron, cardamom and ginger powder to this mixture and drink it twice daily, before breakfast and before bedtime. Omega 3 is another essential nutrient your body needs in order to prevent both physical and mental illness, inflammation and osteoporosis. Animal studies have shown that a higher dietary omega-3/omega-6 fatty acids ratio is associated with beneficial effects on bone health. Ideally, you would receive all the animal based omega-3’s you would need from eating sea food. Looking to add Omega-3 fatty acids to your diet but not a fan of fish? A simple option is to take 1,000 mg of fish oil supplements once daily with a meal. Additionally, the Vitamin D in Fish Oil improves bone mineral density which is important to prevent Osteoporosis. Note: People taking blood-thinning medication should not take fish oil supplements without consulting a doctor. HealthDoyen recommend Orthomega 820 New Formulation 180 Softgels, available from Amazon. Eating prunes (dried plums) on a daily basis helps prevent fractures and osteoporosis. A follow-up study (with rats) showed that prunes were able to significantly reverse the bone loss associated with osteoporosis. One blinded placebo controlled study in humans confirmed the results of the rat studies. Research by Dr. Bahram Arjmandi from Florida State University shows that eating only 10 of these bite-sized prunes per day actually reverses osteoporosis in post-menopausal women. Prunes are good for your bones due to their high concentration of polyphenols, an antioxidant that helps reduce bone loss. Plus, prunes are a good source of boron and copper, two trace minerals important in bone formation. Prunes are a sweet home remedies for osteoporosis, they can be eaten raw, or with yogurt, oatmeal, couscous, salads, risotto, meats, even on pizzas. * Takes steps to prevent falls that might result in broken bones and worsen your condition. Wear low-heeled shoes with nonslip soles and check your house for electrical cords, area rugs and slippery surfaces. * Don’t smoke. Smoking increases rates of bone loss and the chance of experiencing a fracture. * Restrict your alcohol intake, as excessive alcohol consumption is damaging to your bones, and also increases your risk of injury from falls. * Cut down on colas and caffeine intake as it increases calcium loss from your body.